Preschoolers and science go together like peanut butter and jelly. Their natural curiosity about the world makes the word “why” bubble from their lips almost constantly. And that’s a great thing. Give your child a chance to helm her very own experiment with a few simple supplies that will show her how things grow. Throw in something extra to up the fun factor even more…her very own grass pet. Place some potting soil in three cups and plant a generous amount of grass seed in each. Cover with a layer of soil. Water one cup and place it on a windowsill so that it will get plenty of sunlight. 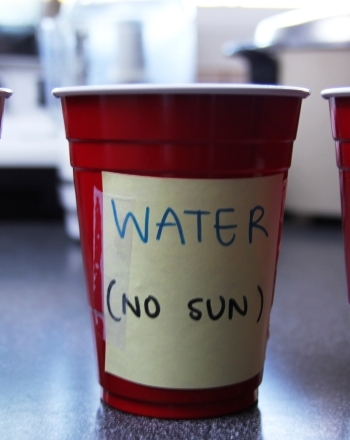 Use tape or a sticky note to label the cup: water and sun. Place a second cup on the windowsill but do not water it. Label this cup: sun, no water. Water the third cup but place it in an area where it will not get any sun or light. Label this cup: water, no sun. Note: Continue to water the two cups of grass labeled to receive water as needed throughout the experiment. 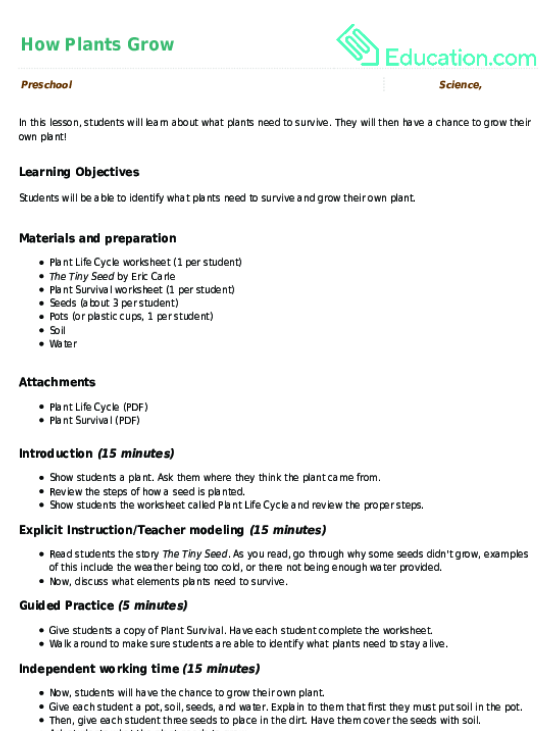 Print out several pages of the journal at the end of this activity. Although you will most likely be doing the writing and labeling, your child should play an active role. 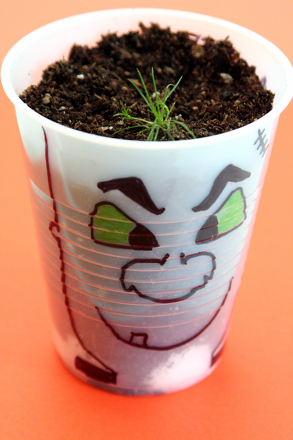 Start the experiment by asking your child to predict which cup of grass he thinks will grow the best. Record his predictions in the journal. Then each day of the experiment, write the date on a new page and label it as “Day 1”, “Day 2”, or whatever is appropriate. Then ask your child to draw a picture of the experiment for that day: a picture of planting the grass, a picture of dry soil, a picture of the first grass sprouting, or whatever he notices. Continue to observe the plants several times a week and have your child record what the plants look like in his journal. This experiment can go on for as long as you still have grass growing in at least one of the cups. Continue to talk about why grass has grown or not grown in each particular cup. As the grass gets taller, have your child trim it with scissors and see if it grows back. This experiment may be all about science, but there’s no reason you can’t add a little kitch. Have you ever come across a “Chia” pet at the drugstore while you had your child in tow? Kids usually find them pretty fascinating and you can make your own version, using many of the same supplies you’ll have on hand. Put a handful of grass seed into a knee high, or cut an old pair of pantyhose at the knee and use that instead. Add about a cup of potting soil and mush it into the shape of a ball. That’s your grass pal’s face! Tie a knot in the hose, tight enough so that the face remains the shape you want it to be. Then paint on features with paint pens, or draw them on with markers. Add some googly eyes if you’d like, and wait for the grass to grow. Soon enough your pet’s “hair” will grow in and be ready for a trim! Learning about how plants grow is a building block in the preschool curriculum. Put a fun twist on this science concept with these cup pets. What is the pet of your dreams? A dog, a cat, a fish, a snake, a parrot? Could it be a penguin or a tiger? It's your world, your worksheet. Draw your dream pet. Cutting Lines: What's in the Grass? 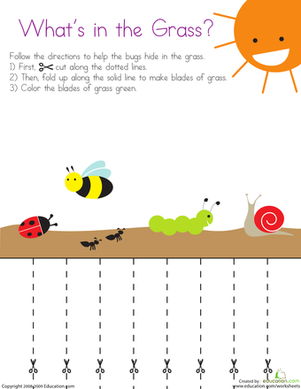 Kids use their cutting and coloring skills to make grass for the bugs to hide in on this prekindergarten arts and crafts and coloring worksheet. They will then have a chance to grow their own plant! Just like you, trees grow as they get older. Count the number of triangles in each tree on this worksheet, and continue the pattern! 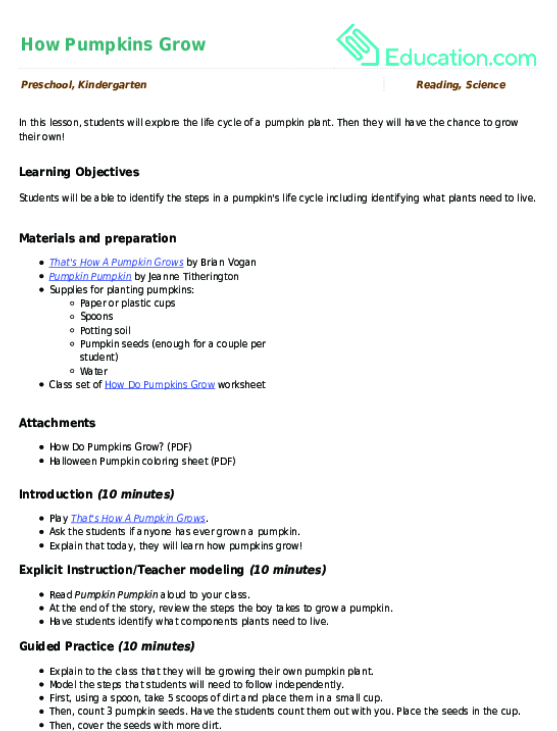 In this lesson, students will explore the life cycle of a pumpkin plant. Then they will have the chance to grown their own! In this coloring page a cow and her calf are grazing in the grass waiting to be colored in. Preschoolers will enjoy adding color to this close-up of a graceful horse grazing on the grass. 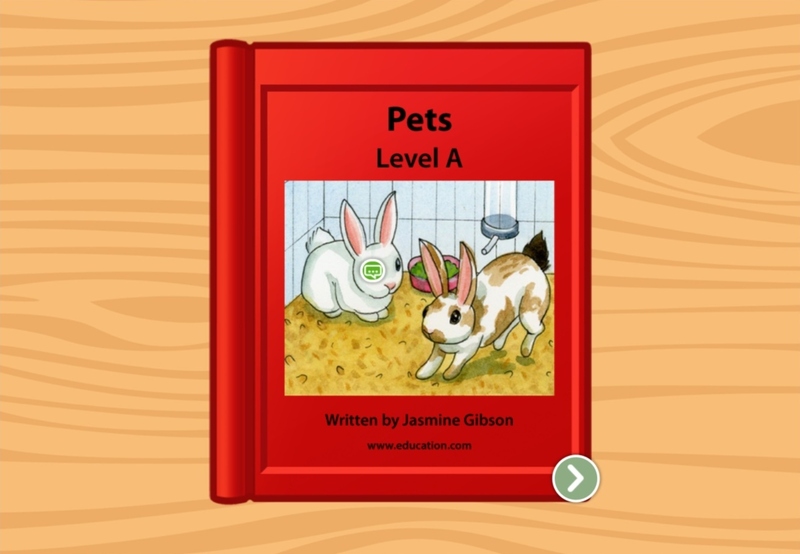 Your students will learn about what farmers do and practice pattern identification!